From Sean's Spring Guesthouse hike up,which is from 1970 meter up to 2800 meter or you can continued to 3000 meter ether over this Haba mountain peak to other side village,over this train to haba village is highly recomended to have local guide to take you to go ! is just to rich the 3000meter peak ,then for the fit peoples will took up 3hrs then may back down 2 hrs,for the slowly peoples will took 4-5 hrs up, then 3-4 hrs come back down. 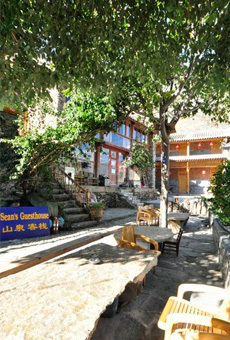 This unique secret tour , you will see the local peoples living life ,you will see the real walnut garden village with all the community cooperation walnut grow project works, you will see the three section of the tiger leaping gorge spot,you will see the all jede dragon lie on side of the yangtze river, the body high from 1650 meter up to 5600 meter mountain,you will feel this is the unique trip by your own.